You may have heard the anecdote that moving—picking up your belongings, removing them from one location and depositing them in another—is one of life’s greatest stressors. We would bet this is true—especially when you are talking about utility asset management and when the moving parts are vital pieces of equipment from one utility pole to another that deliver service to customers. You did not know equipment needed to be moved. If you are an attacher, you are by nature not the first entity to know that a move is needed, and you must rely on communication from pole owners to get the ball rolling. For a variety of reasons, sometimes the notification never reaches its intended destination, and the first you hear of the issue is when your company discovers you have assumed ownership of a whole bunch of double wood. 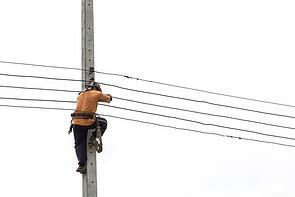 Liability for the assets is now yours, and the relationship between you and the pole owner is suddenly on shaky ground. Stressful, to be sure. Imagine that the most recent glut of transfer requests is only one in a long line of requests, most of which are still cluttering your company’s to-do list. Business as usual needs already have your staff taxed to the limit without a host of other requests coming their way. When the call comes, you figure "Get in line!" and hope you’ll have the bandwidth to work through the backlog soon. Sound anxiety-inducing? It certainly is. Your engineering department is slammed. So slammed, they are telling you not to even ask right now. Your company is in the middle of expansion and engineering could not have more techs on more poles or more trucks in the field than they do right now. Asset management or joint use activities are further down on the priority list than you prefer, and you are not sure when you will have the manpower to complete the transfer requests piling up. Worrisome? You bet. Hiring movers—or more specifically, getting the help of a managed services partner to ease the transition from one utility pole to another. Utility asset management works well as a team effort between your company and an efficient, effective partner. Third party services offer a variety of engagement levels and timeframes, from temporary, supplemental staffing to full-service joint use department takeovers in short bursts or for the long haul. Some also offer software solutions and process development designed specifically to streamline and even automate much of the work of a transfer, permit or detach notice, from communication to documentation. Moving on is hard to do—if you do it alone. Find support and hire "movers" and transferring assets pole to pole might just drop to the bottom of the joint use stress list. What is your company's biggest joint use stress? Answer in the comments below.